Third generation RX-7's are notorious for having marginal cooling systems. 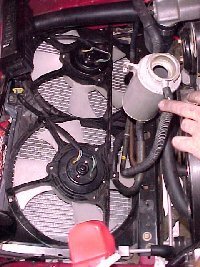 Simply put there isn't enough space under the hood to get adequate airflow nor enough room to mount a properly sized radiator. 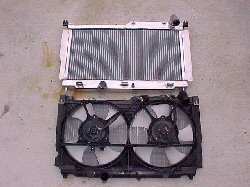 Perhaps in unmodified form the stock radiator might be adequate but the minute power increases are demanded of the powertrain and when driven hard for extended periods of time the inadequacies of the stock cooling system become readily apparent. This is perhaps the reason that one of the first things to add to your vehicle is an aftermarket coolant temperature gauge. The stock temperature gauge is so heavily weighted so as to be next to useless until it is too late. Given the intolerance of rotary engines to an over-temperature condition this gauge is totally useless except to inform the driver when to pull over and call a tow. Therefore in the interest of preserving my car for track use I decided to install the Mazda Competition upgraded race radiator. 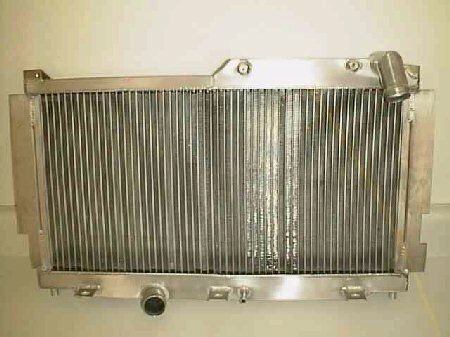 The Mazdacomp radiator consists of a core section 150% thicker than the stock unit and has welded aluminum end tanks verses the stock radiator with plastic end tanks. In defense of the OE radiator it was about half the weight of the Mazdacomp unit. In this area though I think dependability outweighs the benefits of saving a few pounds. installation was fairly straight forward. The Mazda service manual was very helpful. To begin one must remove all the intake plumbing and the intercooler. 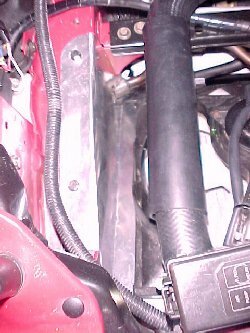 The airbox, intercooler ducting and battery and tray must also be removed. 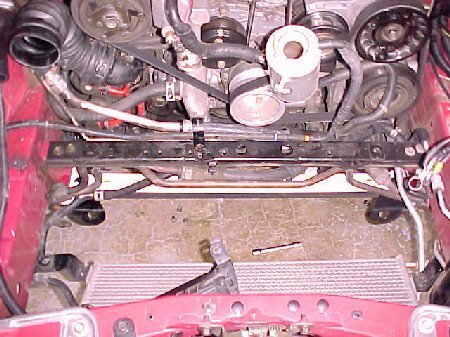 Because the radiator is attached at the lower points to the front sway bar mounts, the undertray and sway bar and mounts must also be removed. 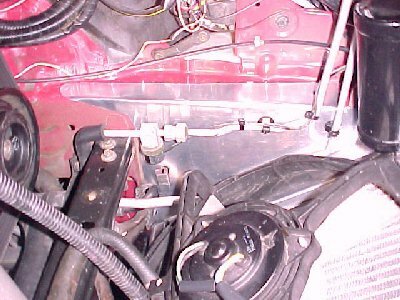 Additionally, proper ducting must be made in the nose of the car to ensure that every last ounce of airflow entering the nose goes through radiator. Many have said, and who I believe, that a properly ducted stock radiator will outperform a poorly ducted upgraded radiator. Now in my case I want a properly ducted upgraded radiator - the best of both. With everything buttoned up I refilled the system and went through he three day burping process and all was well at the next track outing. Ambient temperatures were cool so engine temperatures were not an issue so I shall have to wait until next year to see what effects the bigger radiator will have but I'm sure it will be beneficial.